Well, bargain hunters, it looks like the deal everyone awaits most eagerly each and every year for Black Friday is finally here! 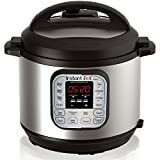 The Instant Pot DUO60 6 Qt 7-in-1 Multi-Use Programmable Pressure Cooker is by far the most popular model Instant Pot makes, and truth be told it’s a bargain at its typical retail price of $100. With Black Friday 2018 right around the corner though, this beloved multi-use cooker just dropped to $69.99. That’s only $2 more than the 3-quart model! This deal sells out every single year, and we guarantee it’ll sell out this year. So if you want one you’d better grab one as soon as you can.